In keeping with our love of the finest handcrafted items, we are proud to feature the work of Arne Mason. Arne is the premier leatherworker in the realm of fishing accoutrements. All of Arne Mason's cases feature the finest English bridle leather with brass fittings, impeccable stitching and classic design. The result of his labor is an item to be cherished for generations. In addition to the aesthetics of his work, leather has such wonderful tactile and olfactory qualities. Remove the top from his brass lined rod tubes..there is a gentle swooosh that reflects on the fine fitting. Open a fly wallet and breath in the smell of the leather, feel the softness of the sheepskin fleece. And perhaps best of all, unlike plastics or metal, these articles improve with age by gaining a patina of warmth and use. Whether you choose an item as a gift to yourself, or as a special present to a fishing partner or associate, all of Arne's cases can be embossed with a name or initials of your choosing. 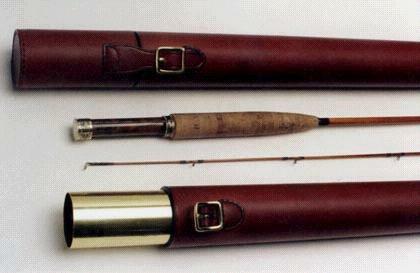 The Ultimate case to protect and present your fine flyrod. 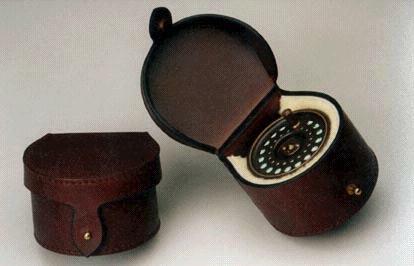 All cases made to fit individually, and are available with brass (shown) or aluminum tubes in three sizes. The top and bottom inside surfaces are lined with foam to protect fine tips. Flawless seamwork. The top 'pops' like a well-lapped ferrule when removed, the fit so well done! A shoulder strap or luggage handle may be added if desired for an additonal $60. Reel cases are available in three sizes with the small size fitting reels up to 2 7/8" diameter, the medium up to 3 3/8" in diameter, and the large up to 3 7/8" in diameter. Solid brass stud closure, hot waxed leather and deep fleece lining gives your reel the very best in protection. 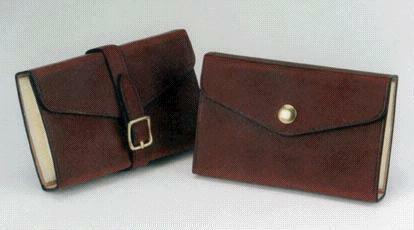 Fly wallets are available in two styles: one with a brass buckle closure and one with a brass snap. They are made in 4" x 6" size, with a very plush sheepskin lining. Initials may be embossed at no extra charge. 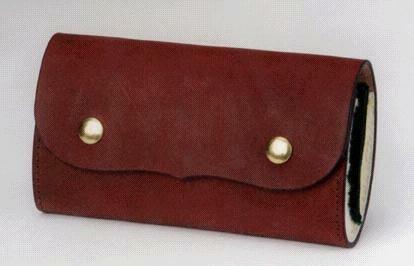 This is the large flywallet and it comes in 4" x 7 1/2" size. Perfect for streamers and salmon flies, it also has the added features of a leather pocket, felt dividers, and two brass snaps. Cost is $80+ shipping. Copyright 2001, 2002, 2003, 2004, 2005, 2006 , 2007, 2008, 2009, 2010, 2011, 2012, 2013, 2014 J.D. Wagner, Inc.